Our Rep will pick you up from your hotel in Sharm early in the morning and travel to Nuwibaa port to board the Ferry Boat to aqaba about 50 minutes. Meet in Aqaba then drive for approx. 3 hours to Petra. 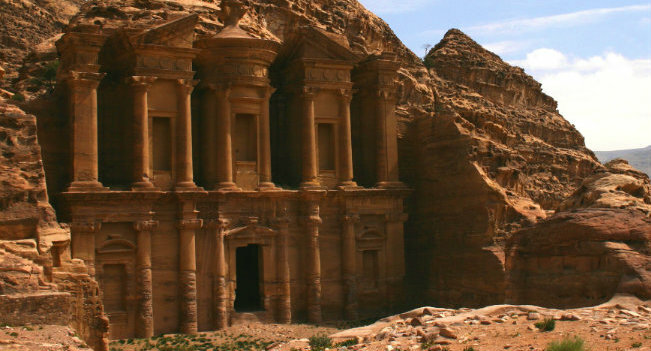 Arrive to Petra, the lost city carved in the mountains, you will first relish a horse back ride to the Siq canyon, it is a natural rock crack that Nabateans used into their substructure elements, it is 1.2 km rich with pretty carvings of statues, idols & niches. Admire the great treasury which is the highlight of the day then stroll the facades street in the way to the roman theater, wander the royal tombs, stroll the roman colonnaded street, visit Qasr al-bent & the archaeological museum. Get your lunch meal in Petra then transfer to Aqaba for free shopping time, take the ferry boat back to Nuwibaa, meet in port and transfer back to your hotel in Sharm.